Space advocates may want to consider approaching religious individuals to boost support for space exploration, according to a recent study in the journal Space Policy. To broaden support for space exploration, advocates should consider approaching religious groups – especially in settings that are familiar to that religion, a new study suggests. The peer-reviewed article by the University of Dayton's Joshua Ambrosius tackles what Ambrosius calls a little-studied topic in the literature: how religion plays into public support of space exploration. The study was detailed in the May 2015 edition of the journal Space Policy. "While there is growing interest in the intersection of religion and space, little to no scholarship has examined how religious belonging, behavior, and belief could shape views of humanity's future in space—and by extension, our actual future in space," wrote Ambrosius, who is a political science researcher, in an email to Space.com. Ambrosius, who identifies as an evangelical Protestant, decided to tackle this paper after reading a blog post by creationist Ken Ham that talked in part about the "desperate and fruitless search for extraterrestrial life," in Ham's words. To Ambrosius, Ham's post signaled that religion may be important for how people think about space; specifically, it shows how religious skepticism of science can even extend into the universe. The surveys were nationally based, taken within two years of each other, and had a random sample of U.S. adults at least 18 years old. 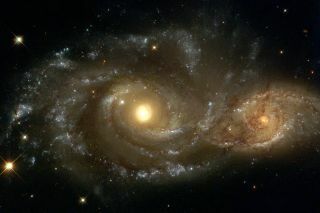 They contained questions about matters such as space knowledge ("The universe began with a huge explosion, true or false? "), space interest, space policy support, space benefits, space nationalism and space optimism. They also recorded religious affiliation and worship attendance. After analyzing the surveys and recording the mean and standard deviation for the questions, Ambrosius broke out the affiliations into six categories: Catholic, evangelical (born-again Protestants), mainline (other Protestants), Jewish, Eastern and no religion. Ambrosius was raised as a Pentecostal and young-Earth creationist, but since has accepted "the fullness of modern science," he said, including Darwinian evolution. Among the groups surveyed, it was his own – evangelicals – that Ambrosius found were least knowledgeable about and interested in space exploration. Meanwhile, those of the Jewish faith and Eastern traditions appeared to know the most and express the most interest. "I wasn't surprised by our generally lower levels of support — but was a bit startled by how consistently we ranked the lowest compared to the rest of the religious spectrum and among the population as a whole," he said. That support, however, appears to be correlated by how positively the local place of worship speaks of science, Ambrosius added. "What I did find is that if an Evangelical parishioner views their pastor as speaking about science in a positive light, they are more likely to see value in space exploration,” he said. "I have no present data on whether clergy speak about space from the pulpit or not (I'm assuming it is very rare)." Ambrosius now calls for more dialogue between the space community and religious believers to build support for space, especially if colonizing other locations is considered a way to ensure our species' survival. "I'd like to see more speculation about which religious traditions will thrive once we achieve interplanetary travel," he added. "I believe my work on contemporary support might foreshadow which traditions will actively evangelize and minister to space colonists." You can see Ambrosius' paper direct in the May 2015 edition of the journal Space Policy.